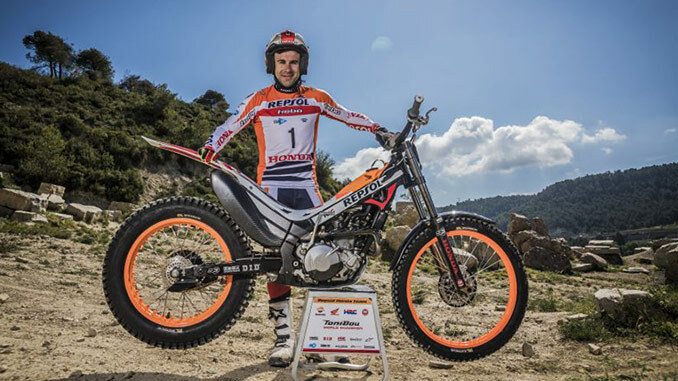 Brilliant twenty-two times world trial champion Toni Bou has made the decision to stay with Repsol Honda Team, whom he joined in 2007, adding a further three years to the contract. Repsol Honda Team and Toni Bou have lengthened their agreement which unites the two parties until 2018, with a longer-term contract. The 22-times world champion’s extension with HRC will add three more years to the contract, which will conclude at the end of the 2021, after fifteen seasons with the team. Toni Bou once again places his trust in both Repsol Honda Team, the result of which has been a lengthy, ongoing success story for both team and rider. Over the last decade Bou has turned into the absolute dominant figure in Trial, becoming the most-garlanded rider in the history of motorcycling with an astonishing twenty-two consecutive world titles. I am very happy to remain linked to this great family, where I have managed to fulfil my lifetime dreams. Here, they treat me amazingly and I attempt to pay it back in the best way I know and try to enjoy it. Being connected to HRC and Repsol Honda Team until 2021 is a particular success in itself too and I will be happy to enjoy these remaining years battling to get more titles and evolving to the maximum. I am grateful to Honda and the whole team for treating me as well as they have always done, and I reiterate that this long relationship with the team also shows the excellent bond that we have always maintained. We are very proud of the relationship we have had for a long time with Toni Bou and are pleased to be able to renew the relationship that unites us with him. Bou is undoubtedly the best rider in the history of Trial and I am sure that, after the 22 world titles, there will still be even more successes. The Honda family is pleased to have, not only the best trial rider, but also an outstanding athlete who is always working to surpass any limits. He is an example to all of us.